Issue: The name of the external GPS name is not identified. Instead, the app erroneously displays “External: none” in the GPS field. Workaround: ignore the misleading display! If the external bluetooth GPS is paired with your iOS device, CloudAhoy will use the external GPS’s data and not the internal GPS’s, regardless of the GPS name displayed. We are communicating with Apple to resolve this problem. We recommend holding off before upgrading to iOS 10 until this issue is resolved. 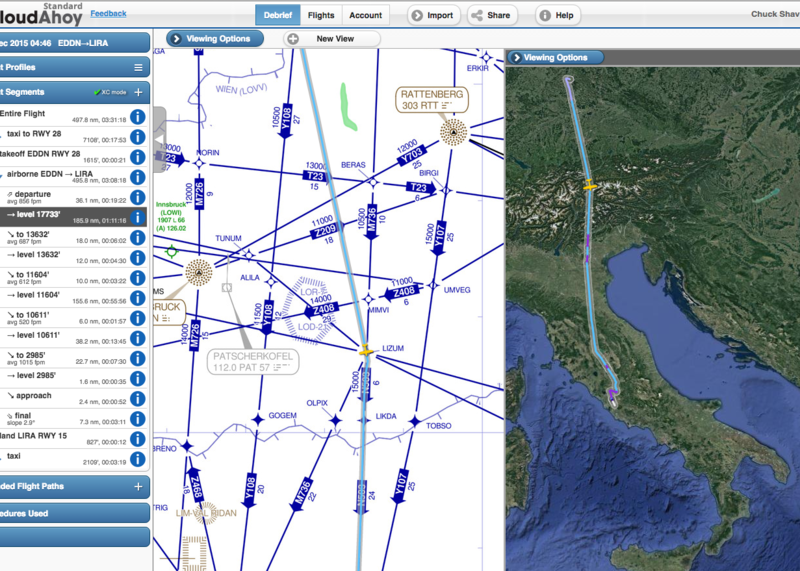 We’re happy to announce that we have partnered with SkyVector to provide aeronautical charts for our users worldwide. SkyVector’s charts are well known by pilots around the globe for their accuracy, quality and speed. It would be the first AirVenture in which I will not have to go “umm, no international charts yet” to our Canadian users, European users or our pilot friends from down under. Next week in Oshkosh we will be showing the charts in our booth! They are now in beta, and will be released soon. 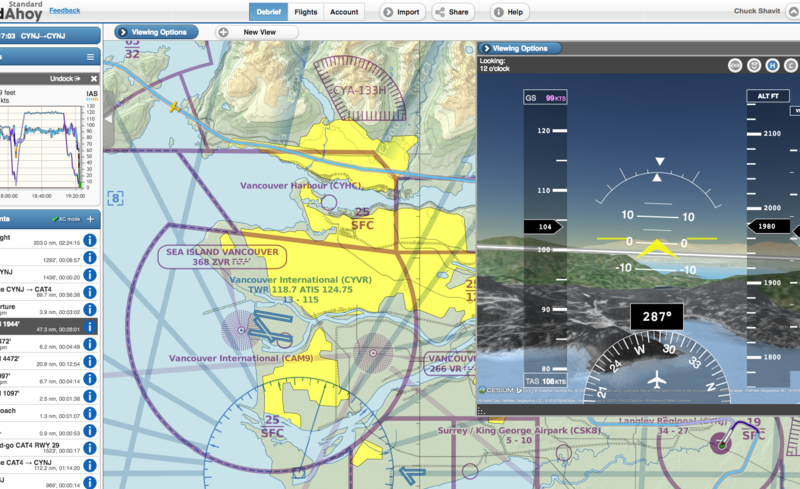 The VFR, IF-Lo, IFR-Hi charts are available in 2D-track, 3D-track and 3D-cockpit modes. Covers the entire globe, not only your flight path. 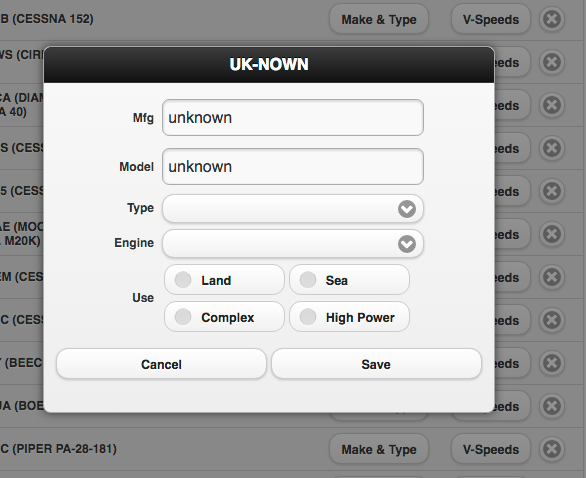 You can now edit aircraft information, including manufacturer and model. Useful if your aircraft is not automatically found in a registry. To edit the aircraft information, click or tap the Make & Type button in the My Aircraft section of the Account tab. You can type the manufacturer and model information, and if desired let the system auto-complete the typing. In several countries including the US we look up the data automatically based on the tail number. This new feature is important in countries in which we do not yet access the local registry. If your aircraft’s tail number is not found in one of the registries that we support, it’s a good idea to enter its data. Doing so will display the type in your Flights list. 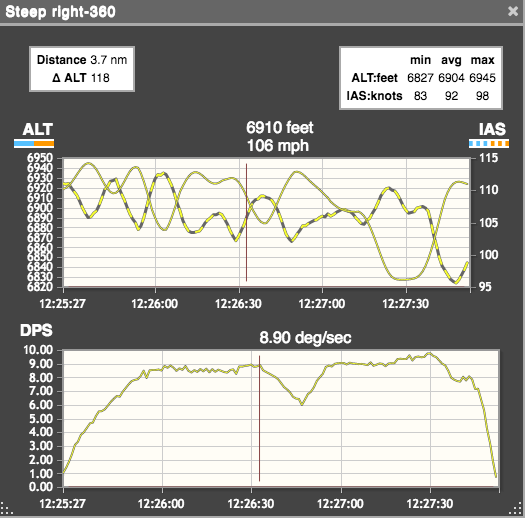 Also, if the make/type is associated with a system-wide V-Speed, the flight analysis will be more accurate (obviously, you can always enter the V-Speed manually). 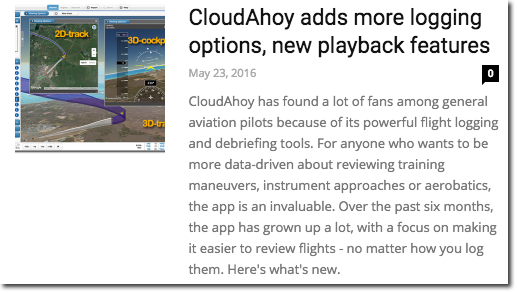 And another important reason: by editing the type you can change the way CloudAhoy analyzes the flight – fixed wing vs. rotorcraft vs. glider. Make/Type of a given tail number is crowdsourced; your editing will also help other pilots flying the same aircraft. 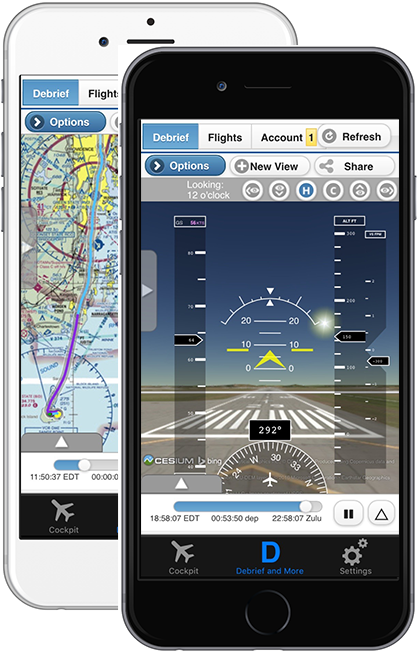 This new feature is one of many to come, to make flight debriefing more effective worldwide. We added a new profile: Altitude + IAS displayed together (with IAS in dashed line), which provides a good insight in many situations. Here are a couple of examples. – The picture below shows one loop around the traffic pattern on a gusty day, with a large airspeed and altitude variance. – The beautiful picture below, sent to us by Don Honabach (thanks, Don!) shows his debriefing of a steep turn of 3×360°, flown in a Zodiac 601HDS. Don clicked the steep turn’s segment info button, and got the Info window below. Note the beautiful inverse relation between the airspeed and the altitude, resulting from the conservation of energy: you lose one and gain the other. For several years you’ve been able to debrief from the web and from our iPad app. With today’s iPhone screen sizes and capabilities, it was time to add debriefing to our iPhone app – which we did! The iPhone6 or 6s’s screen is just big enough for a decent debrief. It has a remarkable processing power, and our 3D visualization works very well on it. After a flight, tap the D tab on the bottom, and debrief. CloudAhoy 3.9 is available in the Apple Store. Last week Sporty’s iPad Pilot News published an article about our recent features. The newly added Moving Map feature does exactly what you’d expect: when the timeline changes, the aircraft symbol stays centered, and the background (2D map or satellite photos) moves under it. 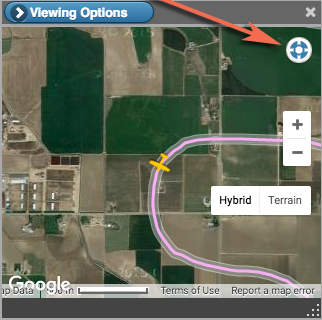 Click/tap the icon on the upper-right of the 2D Track View to toggles Moving Map mode on/off. You can also use this mode to “find” the aircraft after zooming/panning which leaves it outside the view. – Tips for importing from various apps and systems. Click any of the items on the drop-down menu to find out how to import flight data from those systems into CloudAhoy – either directly from an iOS app, or by saving a file which you then import into CloudAhoy. To Import a file – select the top entry in the drop-down menu. 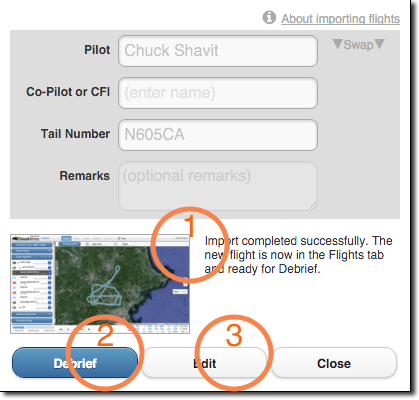 The input form look very much like our iOS and Android CloudAhoy apps for logging, including a “swap” button for swapping the pilots’ names. After all, logging with our app or importing flight data from another device are both equivalent ways of adding a Flight to CloudAhoy’s flight list. 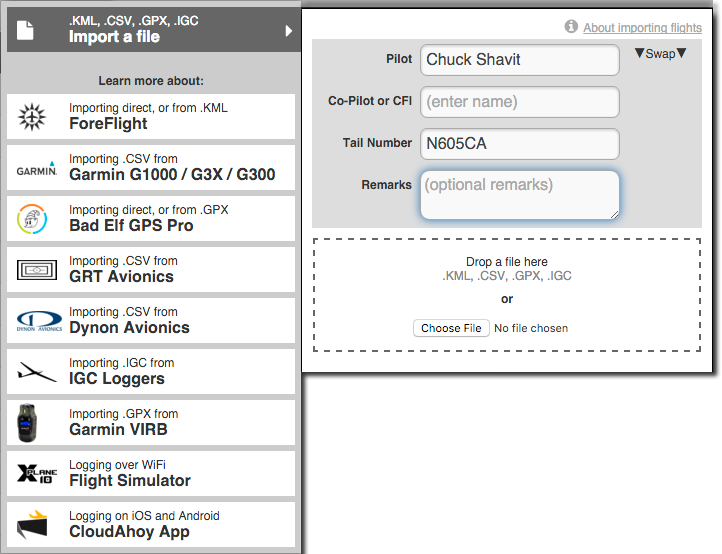 Next, enter the flight’s pilot names, tail number and remarks, then drop a file with flight data to be imported (or select the file with ). After a few seconds the import is complete, and a thumbnail picture is displayed (1). You can now immediately debrief this flight (2). Optionally, you can edit the flight (3) if you want to add/modify pilot/co-pilot, hobbs, etc. You can select 3D Track and 3D Cockpit from Viewing Options, as we described in a previous post, fully integrated with the rest of CloudAhoy. This option exists in our non-beta software, and now we added it to the Beta 3D as well, based on feedback. 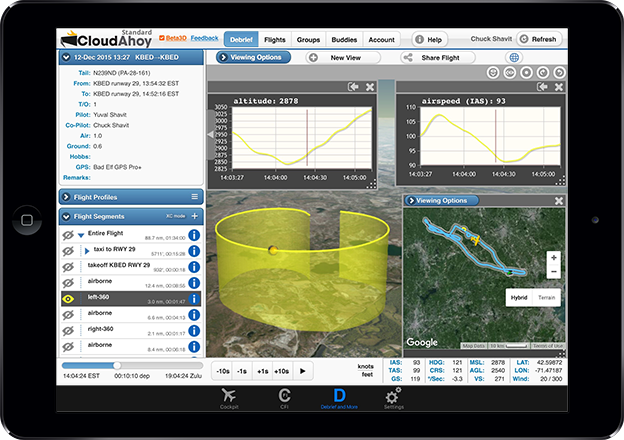 To view your flight in the Google Earth app, tap the Google Earth icon on the top bar of CloudAhoy, and select either 3D Track or 3D Cockpit. The Google Earth app will be invoked and display the flight. Q: When would I use the built-in 3D (Cesium), and when would I use Google Earth? 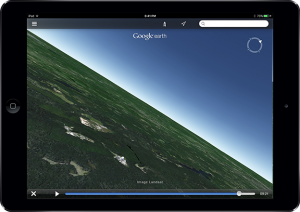 Use Google Earth if you have an older iPad. On older/slow iPads Cesium may not run well or may not work at all, and your only option would be to use Google Earth. Use Google Earth if you would like to see 3D buildings and trees. Google Earth displays them, Cesium does not. Some users prefer the rendering of the Google Earth app, some like Cesium’s better. Q: What is the disadvantage of using Google Earth? 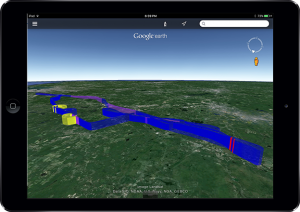 A: Google Earth is a separate application, and is not fully integrated with CloudAhoy – you can see your 3D Track with color coded segments, and cockpit view animation, but none of the other features. It is often useful to focus on one maneuver of a flight, and see this maneuver in context. We’ve just added a new feature to make it easy. □ On the Flights Segments (left pane) click the “eye” next to Entire Flight, then click the “eye” next to the segment(s) you want to focus on. □ Click New View to create a small view. 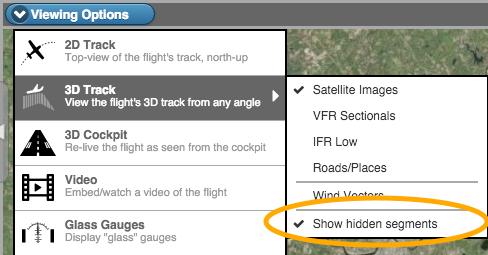 □ Click Viewing Options, select “3D Track” and “show hidden segments”. 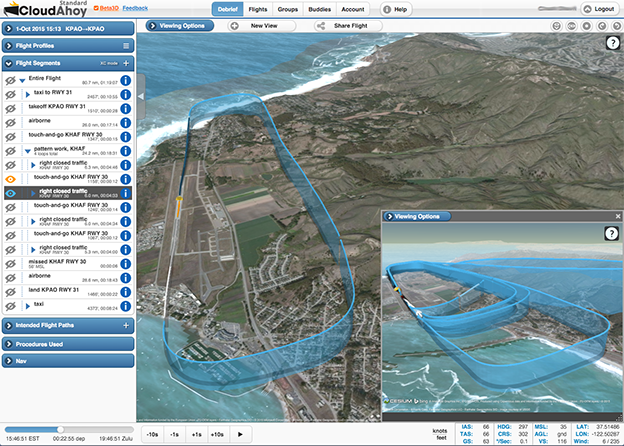 This technique allows you to view selected parts of the flight in one view, while displaying the entire flight in another to see things in context. Another example: focus on a student’s left 360 maneuver. The screenshot below (taken on an iPad) shows both the entire flight, and a zoom on the decluttered maneuver. By moving the aircraft symbol , a CFI can highlight the issues in this maneuver.